Note: The Small Bodies Browser (SBIB) is not an analytical tool but to find useful images, download them and use other tools. SBIB is designed for exploring data in several ways: Search by image name, show a sequence of images, search for images near a location or region. 'Search Name': This lists all the images with any portion matching the name. 'Show Sequence': This lists all the images that match the sequences selected (such as Survey). The mission phases contain a large amount of data. It is recommended to select a specific cycle (such as Survey Cycle1) rather than the entire sequence. Search on the map: This searches for images that contain the coordinates. These can either be entered in the Latitude and Longitude (in positive east coordinates) boxes or by clicking on the "Map" region for a specific location. An "X" will appear where the search coordinates are located. Instead of a specific location, an area can be selected by dragging the cursor to create a box. The coordinates will be listed in the Latitude/Longitude boxes. The search filters do not apply to the 'Search Name' button. Using the "Search" area (see figure above), a variety of criteria can be selected to limit the number of images listed. Once selected, the 'Search' button has to be clicked to activate the filter. If more than one filter is selected, all of the criteria are met for selecting the images. Instrument: Chooses all, several, or only one specific instrument. (Note that for Eros, only one instrument is available in SBIB). Resolution: Selects all images with a resolution (in meters) ≤ the value provided. 'Show Sequence': Selects one or multiple sequences (or mission phases) by clicking the appropriate box(es). Double clicking on the text of a sequence title (e.g. HAMO Cycle 2) deselects all the other entries. Once a list of images has been selected, several options are available. Sorting the "Image List": The "Image List" can be sorted by clicking on the headers (e.g. Name, Inst). Footprints: The map shows footprints of the selected image(s). Multiple images can be selected by using shift or control click. 'All' and 'None' buttons that will select everything and nothing are also provided. 'List': lists the information of the "Image List" in a pop-up window that can be cut and pasted into a file. 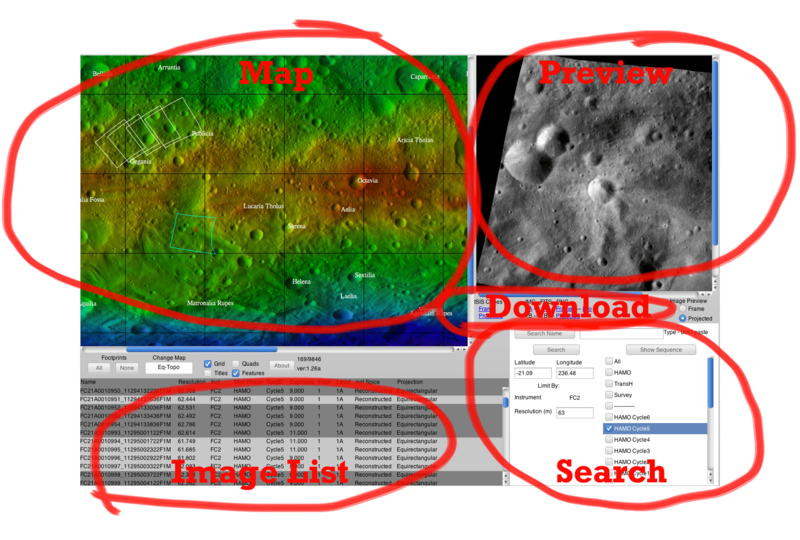 'About': opens a new tab (or window) with details about the data (mission phases, data processing and coordinate systems used in SBIB). Quick Review of the Surface. : Clicking the first record in the "Image List", shows the footprint and preview. Using the keyboard's down arrow each image and its corresponding footprint can be displayed quickly, and the entire "Image List" can be scrolled through. "Preview" (see figure above): a jpg preview is displayed on the right hand side of the window. The preview image can be changed from 'Frame' (the view that the camera had) to 'Projected' (a map projected view). The preview images may have a polar projection (where available) if they are located near the poles, and their orientation matches the footprint shown on the Map. "Download": Several weblinks are active. One-click download for whichever desired data products is provided. The derived data products (such as ISIS cubes, PNG, etc) will be based on the best quality data available. ISIS Cube, Projected (import into ArcMAP 10.1). IMG format. Original format from the instrument team, level 1A (and 1B when available). FITS format, level 1A (and 1B when available). PNG, Frame (as the spacecraft camera saw it). Info: This provides the camera and field of view metadata, such as date, incidence, emission and phase angles, spacecraft position, Sun position, center latitude and longitude. ENVI: For VIR data, this will provide the images and headers. needed to load the image into ENVI. The map display shows the surface of the object with additional options. 'Change Map': Different Maps are available and can be selected from the box. 'Grid': Displays a longitude and latitude grid. 'Quads': Displays quads where available. 'Titles': Provides labels: provides the image name on the map if an image was selected; labels longitude and latitude if 'Grid' is selected, and names the quads if 'Quad' is selected. 'Features': displays the name of surface features where available. The images have been projected either as an equirectangular or as a polar projection. The table list which one was used. The footprint matches the projected image when the similar map is used. For example, if an image was projected as PolarStereographic, then it will render correctly on a map of the pole, but be skewed when compared to the equatorial map. Images of the poles would be unnecessarily large if they were projected as equirectangular. Some images are rotated so North is no longer up. Images of either of the poles that are projected in PolarStereographic projections do not have a normal pole. The North pole does not have a North, and the edges of the image all point to North. Because of this confusion, the projected images are oriented to match the footprints. email epalmer at psi dot edu with questions, comments or concerns.